When you like backpacking as much as you like staying connected at all time, you do need a good solution for doing both, with no sacrifices on each side. You can easily get a solar backpack but you may just as well try a solar charger that you can also take along when not backpacking. There are plenty of options out there but only some may fit your true needs when backpacking. This is why you need to pay attention to some details and, why not, follow some tips when shopping around. For instance, you need to check the amperage/wattage, and voltage of your solar charger as the more you know about it, the more you can chose the one that fits your needs. It’s one thing to need a solar charger for your laptop and totally, another if you’re only need one for your iPhone. Even though most solar panels work only when the sun is out, you may also find solar panels that come with an external or internal battery. The additional battery charges from the solar panel, allowing you to get the energy from the solar panels during the night. The bigger the number on the battery, the more energy you get for your unit. As you may need the smartphone now, you may also want a solar charger that charges fast. When and where you use the solar charger is essential and you shouldn’t rely much on it if the weather is cloudy. Many of the solar charges out there come with one USB port, but it’s common to find solar charges with several connection points so that you’re able to charge more than one gadget. Last, but not least, try to get the solar charger that really meets your needs. The more efficient the solar charger is, the bigger it is, which minimizes the storing space in your backpack, not to mention the additional weight. Don’t forget to check the price tag also. No matter how much you want to use your phone while backpacking, you still don’t want to pay for it more than you did on the backpack itself. 1). 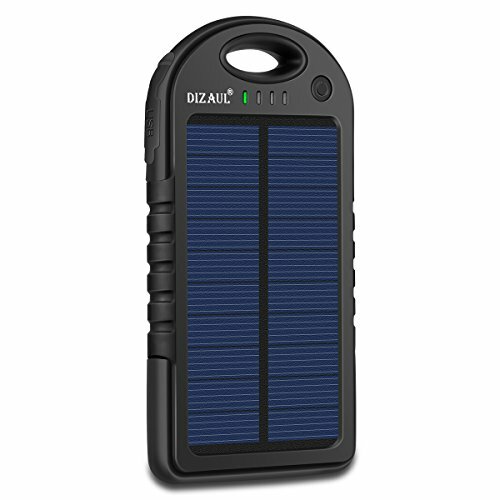 Lightweight and small, the Solar Charger, Dizaul 5000mAh Portable Solar Power Bank manages to get you out of an emergency while backpacking. The solar charger is made with eco-friendly silicone rubber and ABS+PC material. The football grain design presents an anti-skid protecting effect and the charger is water resistant. This gives it versatility and the ability to use it on a rainy day. We also have to specify and shockproof feature that means the solar charger can take a drop or two. The free hook explains its portability and you may easily carry/attach the solar charger on your backpack. The USB ports are well made and protected by rubber caps, for more water resistance. You may use it to charge your smartphone, tablet or any other 5V USB-charged gadget. Lightweight, portable and small, the solar charger comes in nice, fun colors. Even if needs some time to charge, it’s dependable for many situations. As long as you’re aware of its limits, we’d say you do end up with a good deal when getting this solar charger. 2). 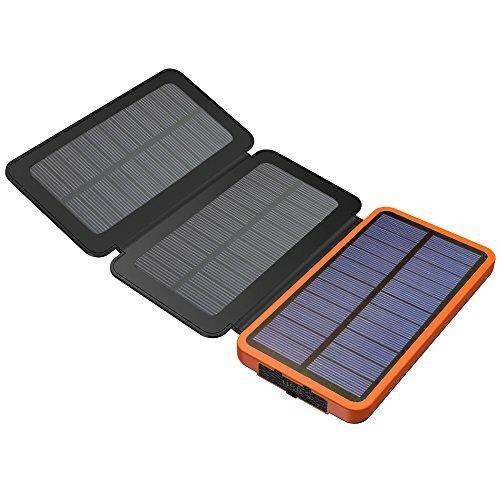 The rugged build of the Solar Power Bank, X-DRAGON Solar Charger with Foldable Solar Panel 10000mAh Portable Rugged Shockproof is one thing that recommends it for backpacking. The solar charger includes 3 Premium Solar Panels, which means it’s pretty fast and powerful, considering its weight and size. You may give it around 25 hours for a full charge. The charger presents Dual Recharging Technology, which means you may use either the sunlight or the car charger, for instance, using the DC port. The build-in smart IC chip for every USB port lets you charge two gadgets at the same time. Another great thing is that the charger may automatically identify the device, increasing its charging speed. As for the build, it’s not only sturdy, but also well thought out. The charger comes with build-in LED that you may use as torch in the dark. The 3 modes on the lights (steady, SOS and strobe) make the charger even more versatile. The solar charger has a leather sheath and ABS outer surface and it’s easy to fold for easier storage. It can handle a splash and a fall, as it’s rain-splash resistant and shock proof as well. You may use it for all sorts of iPhones and smartphones and various devices. Compact, portable and quite powerful, the solar charger is a versatile option when backpacking. For the versatility and reliability though, the solar charger is quite an option to consider when shopping. 3). 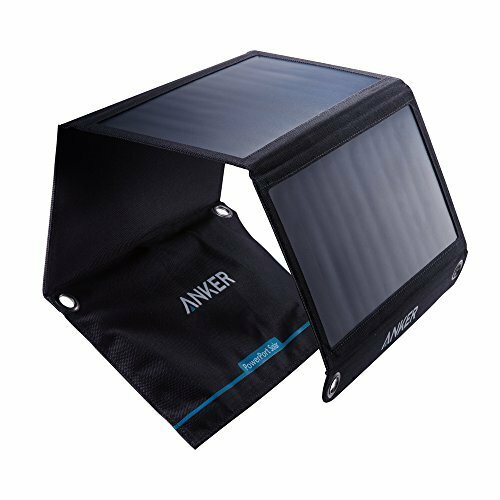 Thin and dependable when backpacking, the Anker 21W Dual USB Solar Charger, PowerPort Solar is a good choice to consider whenever in need. The solar charger features Fast Charging Technology and gives fast charging speed, up to 2.4amps per port. It’s strong enough to charge two devices at the same time. The PET polymer faced solar panels are long lasting and sewn into a tough polyester canvas. 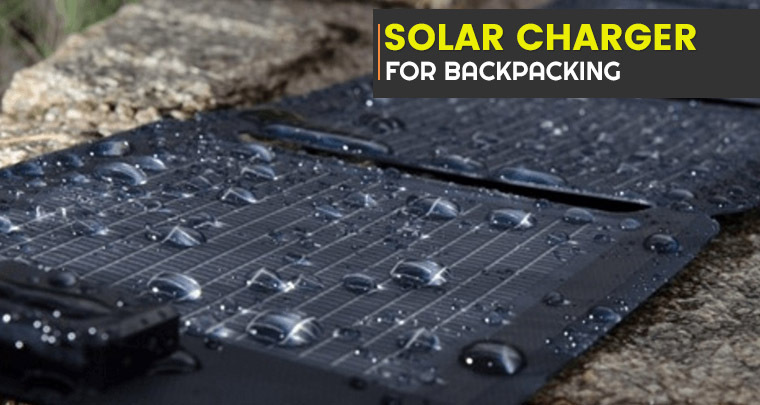 This makes the solar charger weather-resistant and able to handle the backpacking challenges. We also notice the amazing portability of the solar charger and its stainless-steel even holes on each corner let you easily attach it to your backpack. The charger also has a compact size, is very thin, and folds several times for easier packaging. As for the safety, no worries either. The solar charger presents a short circuit and surge protection technology, keeping you and your gadgets safe at all time. In order to expand its lifespan, it’s better to minimize moisture exposure for protecting the electrical parts. You may use it for Apple and Android smartphones, tablets and all sorts of USB-charged devices. Nevertheless, for a good price, you get a reliable, foldable and attachable solar charger that makes backpacking so much easier. 4). The more you’re willing to pay for your solar charger, the more you get when it comes to performances and build. It’s the case of the Suntactics S5 Solar Charger that doesn’t disappoint on so many levels, even though you may feel like paying an arm and a leg for it. The solar charger comes with a long lasting construction and is very dependable. Its solar cells and electronic connections are entirely encapsulated, for better resistance and longer lifespan. The good build doesn’t stop here and the charger includes high compression substrate that minimizes risks for stress failure. The charger is also impact resistant, able to take a few drops. The solar cells are impressive and give great light-to-voltage conversion, ensuring higher charging speed. Silicone is sealing the circuits, so the charger handles a submersing up to 40 ft. of water. The charges is impervious to moisture and corrosion resistant. Another thing to mention is the patent pending Auto-Retry technology that protects your devices during power interruptions (clouds are a cause, for instance). The charger re-starts few minutes after a power fluctuation. The solar charger is designed for hiking and backpacking so it’s not only small and compact, but also easy to attach and to carry around. It comes with a travel pouch and packs very small. The anchor point rivets ensure easy mounting and the charger is well made. It’s fast and gives consistent charge. All in all, for all the good things it brings to the table, the solar charger is a sure buy anytime. 5). Entirely waterproof and presenting a rugged build, the Powertraveller Powermonkey Extreme 5V and 12V Solar Portable Charger is a reliable tool to have whenever backpacking. 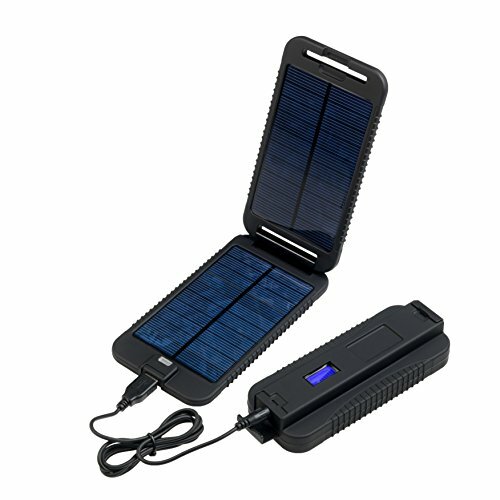 The solar charger has a tough build and you may use it for charging your iPhone or Smartphone up to 6 times. It comes with standard USB and 12V DC port output, becoming more versatile. As a matter of fact, you may charge both a 5V and a 12V device at the same time when using the charger. Lightweight and easy to carry around, the solar charger has a compact size and folds nicely. Its clamshell design has a small foot print and you may easily attach the charger to any backpack, or even a tent using the Velcro strap from the charger. Compatible with almost any 5V electronic device, the solar charger is a great tool to have around. You may also use it for devices requiring 12V to charge. 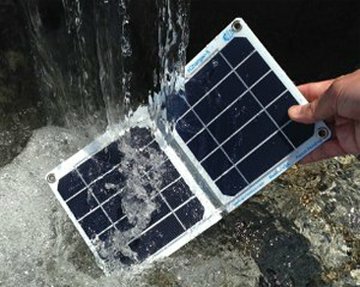 The IP67 rating of the solar charger means it’s waterproof for 30 minutes up to 1 meter. The charger takes a drop as it’s shock-resistant and its build-in Velcro strap lets you easily attach it to your backpack. The solar charger is easy to use even when hand gloved thanks to its friction swipe on/swipe off switch. Versatile, compact and rugged, the solar charger is a one heavy-duty companion while backpacking. Regardless the minor issues, for the rugged build and amazing versatility, the solar charger is a good option for any backpacker.